There is a new feature for the iPhone 4s and the 3rd Generation iPad that will make it more user-friendly for those with dyslexia. The onscreen keyboard of these devices now has Voice Dictation that will provide speech recognition capabilities. 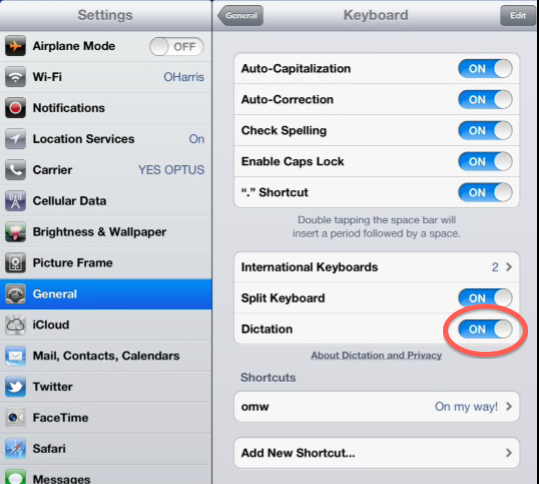 To make the Voice Dictation microphone icon appear on your keyboard, select "General" in your Settings, select "Keyboards" and turn on Dictation. To use the new feature, open a document in Notes, Pages, or another writing app. Tap the Dictation key and dictate the text to be inserted into your document.